AleaSoft, August 2, 2018. 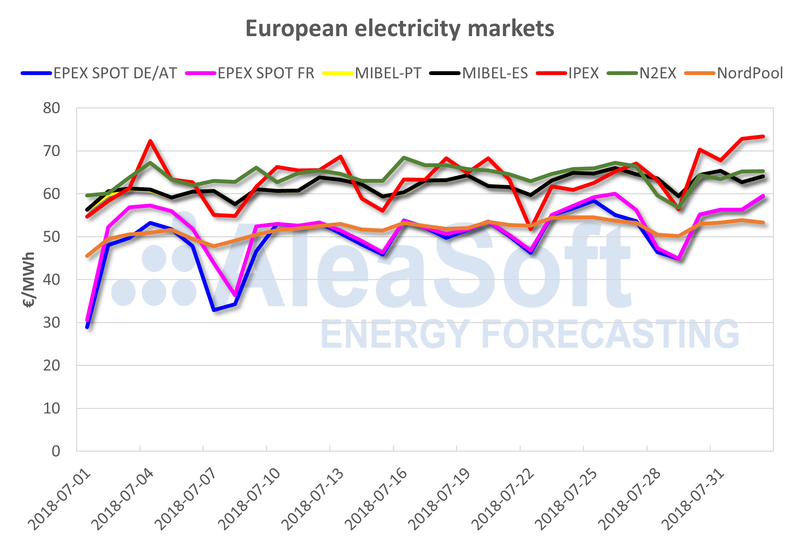 After records registered in the monthly prices for the months of May and June in the Spanish and Portuguese electricity market MIBEL, a new record was now obtained for the month of July, the most expensive since 2008. The AleaSoft analyses point to the fuels and CO2 emissions expensive prices together with low wind energy production, as the main factors. The Spanish and Portuguese electricity market price record was broken in July with 61.88 €/MWh, the highest of the decade for a month of July. The previous high values were 68.19 €/MWh in 2008 and 64.40 €/MWh in 2005. 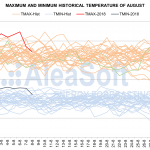 Based on AleaSoft’s data analysis for the month of July, the European markets increased their price over the course of the month. The most expensive, UK, Spain, Portugal and Italy, from 60 to 65 €/MWh and in the case of the less expensive, France, Germany and Nord Pool, the increase varied from 40 to 55 €/MWh. 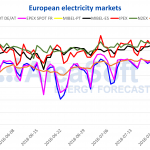 The cause was the high price of fuels and CO2 emissions and the low wind energy production taking into account that in these European countries the electricity demand remained stable, being 30,000 MWh the average daily value for Spain in the month of July. With respect to AleaSoft’s analysis of fuels, Brent oil price remained stable since mid-July moving in a range between $71 and $74 a barrel. Compared to the values of $80 a barrel in mid-May, a slight downward trend is observed. Rumors of a possible meeting between President Trump and Iran government, together with a production increase by Saudi Arabia and Russia, may lead to the price being relaxed in the coming weeks. The exchange rate between the dollar and the euro has remained stable during this month of July around $1.17 per euro. CO2 emissions remained high, touching the maximum of 17.4 €/t, following the upward trend that began in April this year when values were around 5 €/t. API 2 coal short-term futures prices dropped from $102 a ton on July 11, to $95 a ton in recent days. Since April they had had an unstoppable recovery from $78 per ton. Gas futures for Q4 in OMIP market have been with a stationary trend around 26 €/MWh during the month of July. Electricity futures for Q4 in OMIP market experienced an upward trend during the month of July going from a minimum of 64.35 €/MWh on day 4, to 67.75 €/MWh on day 25, although at the end of the month they relaxed until 66.80 €/MWh. Similarly, OMIP futures for year 2019 rose in July from 54 €/MWh to 56 €/MWh. This situation of high prices is ideal for generators, from large to small, to make bilateral contracts or sales in futures markets in the mid-term, with a horizon between one and three years, because this situation can be reversed if Fuel prices begin to fall in the short or medium term. On the other hand, the large consumers who did not foresee that price could rise, either because they had a comfortable contract that expires soon, or because they always go to market, will have a complicated situation. At AleaSoft, we recommend our clients that it is important to have an overview of market prices in the short, medium and long term, and also, it is important to have a vision of the price variability in all horizons in order to be able to adequately manage risks.